The students at King Elementary School have Principal Anthony Gelsone seeing stars — four of them. Celia Shortt Goodyear/Boulder City Review King Elementary School Principal Anthony Gelsone shows off his new haircut in celebration of the school's new four star rating by the state. He promised the students he would shave it, if they reached that milestone. Improved performances by students led to a four-star ranking by the state for the 2017-18 school year, an improvement over last year’s three-star rating. The rating means the school is commendable and has performed well for all students and subgroups. All students demonstrate satisfactory to strong academic performance, and the school is successfully promoting academic progress for all student groups as reflected in closing opportunity gaps. After receiving a low score in math during the 2016-17 rating period, the school upgraded its math curriculum. 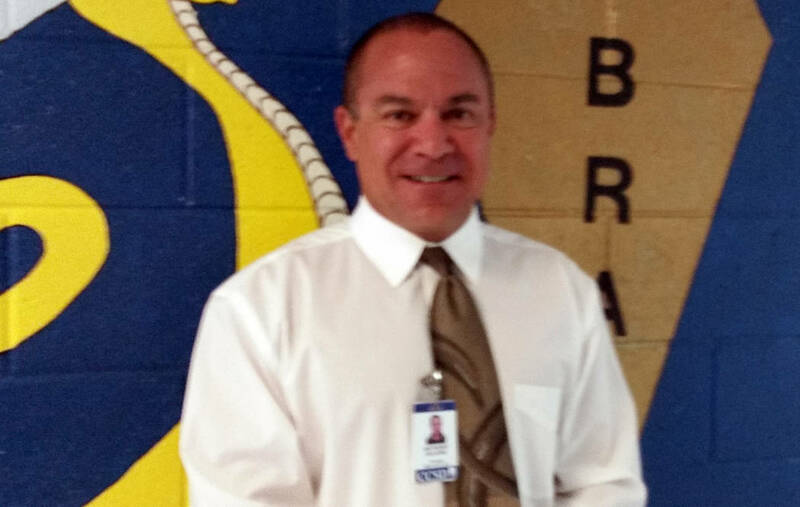 The change in the school’s rating also brought a change in the principal’s look. Gelsone said he promised students that if the school earned a four-star rating, he would shave his head during the morning announcements, which he did. The community also rallied behind the school. The other public schools in the city created encouraging videos and cards for the students. The mayor, police department, community members and the Boulder City High School band and cheerleaders encouraged them at a pep rally in March. King Elementary earned the four-star rating with an overall index score of 68.67. It needed a score of 84 to receive five stars. Although its academic achievement dropped one point compared to 2016-17, the school’s other achievements pushed its score to the four-star level. It was also selected by the Clark County School District as one of 25 Shining Stars for being a high-performing school with a high percentage of students in poverty. Joining King as a four-star school is Boulder City High School. “BCHS plans to continue to work with all staff members to increase our academic achievement and college and career readiness standards in order to achieve a five-star rating that was missed this year by two points,” said Principal Amy Wagner. The high school had an index score of 79.78 and needed an 82 for the higher rating. The state did not rank high schools during the 2016-17 school year. Garrett Junior High School, which had a five-star rating for the 2016-17 school year, dropped to three stars, despite having a high enough index score. Hood said the school is working across all subject areas to improve the subgroup. Mitchell Elementary was not ranked because it does not have the required data for a rating. It teaches students in kindergarten through second grade, and some of the data cover students in third through eighth grades.